Tensions have escalated in Uganda's capital after a court appearance for opposition leader Kizza Besigye was canceled and two opposition leaders were arrested. Besigye is charged with treason after calling February's presidential poll rigged and declaring himself president. When it became clear that Besigye wouldn't attend Wednesday's hearing, the packed courtroom erupted in anger. 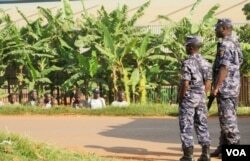 The government cited security concerns for Besigye's absence, saying that they couldn't risk bringing him to court. 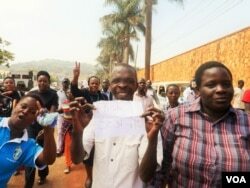 Although the chief magistrate called for calm, Besigye's supporters continued to demonstrate, eventually shutting down the session. They remained in the courtroom demonstrating their dissatisfaction by holding prayers and singing that one day President Yoweri Museveni would die and they would be free. The demonstration remained calm with no police intervention. One activist with Besigye's FDC party, John Mugabe, says they just wanted to be heard. “We are not here to cause disruption; because, as Ugandans, we are here also to defend our vote, which was rigged; however, as much as the police and the state are trying to push us to that side, to cause violence, but we know Museveni is good at violence," said Mugabe. "And we are going to demonstrate in a free and fair way according to the constitution; but, violence is not our weapon to use at this side." Besigye's next court appearance is scheduled for mid-June.